Hit the right note at the NACUBO 2015 Annual Meeting, July 18–21. 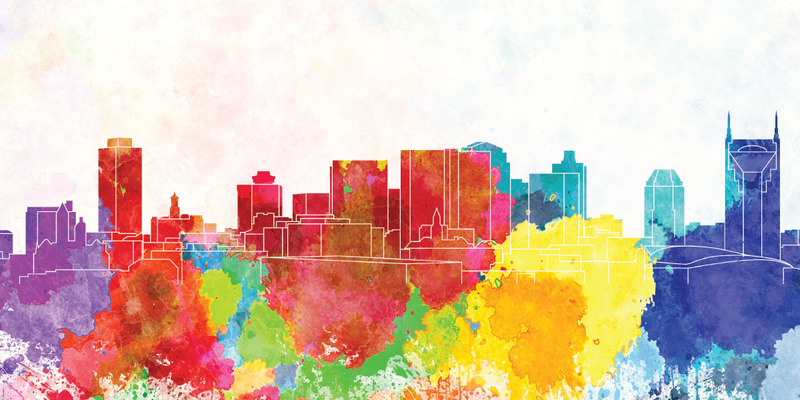 With its burgeoning cultural scene, from culinary arts to entrepreneurial ventures, Nashville is the perfect location for dynamic professional development. 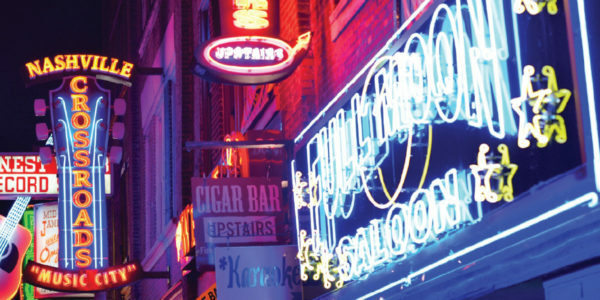 About midway across Tennessee, the city of Nashville is often associated with eclectic music, live bands, and the Country Music Association awards. 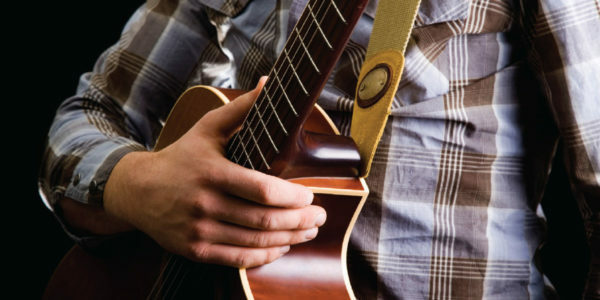 While it’s often referred to as Music City, Nashville is undergoing a number of changes that are revitalizing the city. It’s a charming location full of Southern hospitality, and it’s quickly becoming known for more than just music, due to a vibrant art, culture, and food scene. If asked to name which U.S. city has the best culinary offerings, it’s likely you’ll name big cities on the East or West Coast; however, more and more self-proclaimed “foodies” are heading to Nashville for robust and diverse choices. The city even has its own two-day food and wine festival that features top chefs, winemakers, and, of course, music. In this burgeoning cultural atmosphere, an increasing number of recent college graduates are opting for Nashville as the place to begin their careers. The city launched WorkIT Nashville in 2013—a campaign to recruit technology workers to the area. Moreover, in the same year, Google announced Nashville as one its partners in the Tech Hub Network—a space for talented entrepreneurs to develop innovative startups. With all that is changing, it should come as no surprise that Nashville was named one of the fastest growing cities of 2015 by Forbes magazine. Even though Nashville is becoming increasingly popular and moving to a different beat, you can still find iconic music staples. On Music Row you will find various recording studios and RCA’s Studio B where Elvis Presley recorded more than 200 songs. At the Country Music Hall of Fame and Museum—venue for NACUBO’s annual meeting opening event—you’ll take a journey through the history of country music. Nashville’s changing atmosphere made it the perfect location to host NACUBO’s annual meeting themed “The Tempo of Change.” Through general and concurrent sessions, attendees will learn about key issues affecting the business office, how to effectively implement solutions to maximize results, and engage in spirited discussions on reinvigorating campus operations. Check the annual meeting website at www.nacuboannualmeeting.org to see a list of options for targeted learning opportunities in small group meetings. Roundtables and forums. These sessions offer unique opportunities for attendees to identify and share pressing challenges, explore potential solutions, and learn from the experiences of colleagues. Choose from the roundtables for senior leaders at comprehensive or small institutions, or community colleges. Topics include women’s issues, global operations, and ways to serve minorities. Building the Online Enterprise: Funding, Governance, and Revenue Sharing Strategies. Nearly all colleges and universities offer online courses, but creating a more unified and comprehensive selection of courses requires well-planned financing, governance, and incentives for cooperation among schools and other partners. This panel will discuss approaches to fostering cooperation and innovation in the expansion of online and digital offerings at their own institutions. Designing Voluntary Separation and Early Retirement Incentives. The University of Louisville, Ky., recently completed the design and implementation of a voluntary separation incentive for qualified faculty and staff. The program resulted in significant cost savings and produced additional operational and strategic benefits for the university. During this session, presenters will discuss the university’s goals and objectives in offering the incentive and will outline each of the key elements of the program. Delivering the Cloud to the Academy, While Enhancing Enterprise Efficiencies. Advanced cloud technologies are key to leading transformation and enhancing mobility for diverse users, but moving to the cloud isn’t merely a technical issue. A panel of leaders in higher education will discuss how they are providing an organizational cloud delivery platform, which is responsively delivering a diverse portfolio of applications to the academy’s broad user base, while creating substantial efficiencies for the enterprise. Enrollment Is Everyone’s Business: The Growing Role of Top Financial and Academic Leadership in Admissions Strategy. With dwindling government appropriations, the uncertainty of institutional investments, and price sensitivity to tuition increases, universities are becoming increasingly more tuition dependent. Panelists will discuss a collaborative, data-driven approach to making decisions about enrollment, a process that balances strategic initiatives with financial objectives to ensure the long-term sustainability and success of the institution. Shared Services: Two Years Later. This session will provide examples of various shared service models implemented throughout the higher education community, present the institutional objectives at the beginning of each project, and examine ways in which this new data will shape the next generation of shared services centers for many colleges and universities. A Case Study in Procurement Transformation. Colleges and universities are seeking to sustain academic excellence, as they operate in uncertain and challenging funding climates. This presentation will explore how Johns Hopkins University, Baltimore, embarked on an administrative excellence initiative designed to improve administrative service levels, curb spending growth, and allow the university to devote more resources to its core research, education, and service missions. Collaborating for Impact: CBO/CAO Partnership in Practice. As CBO, you have a bird’s eye view of the academic, administrative, and auxiliary functions across campus. From this perspective you may see the need for change, but how do you cultivate a partnership with your institution’s chief academic officer in order to implement these necessary changes? This session will explore how the CFO and provost at the University of Colorado, Boulder, are navigating a joint project to bridge the gap between the business officers on both the administrative and the academic side. Sexual Misconduct on Campus: Legal Obligations and Approaches to Compliance. The Violence Against Women Reauthorization Act of 2013 imposes a range of new campus safety requirements pertinent to sexual misconduct and prevention. Learn how to assess your institution’s policies, procedures, and practices related to sexual misconduct on campus, and ways to take practical steps to implement and enforce an effective compliance system. Vertical Integration and Expansion for Community Colleges. In recent years, as the importance of workforce development and college affordability has garnered national attention, community colleges have evolved significantly. This presentation examines two case studies: (1) a community college and industry-driven initiative at a smaller college to offer baccalaureate degrees in a region where the economy is booming, and (2) strategies adopted at a larger community college to meet evolving market needs through partnerships with four-year institutions and high schools. What Now? Understanding Institutional Capacity in a Climate of Change. Like many universities, the University of Tennessee, Knoxville, seeks to optimally align enrollment with institutional capacity. This session will focus on UT’s Capacity Study, an internal effort that evaluated the institution’s current capacity and determined areas of potential constraint related to different enrollment scenarios. Attendees will learn about organizational change and other success criteria for effective cross-functional planning. The Growing Cost of Being Financially Conservative. Fiscally conservative balance sheet strategies have dominated higher education policies in the last five years, as institutions sought stability in the wake of the financial crisis. Panelists will describe the trade-offs and benefits of broadening the solutions post-crisis, and ways their institutions have evaluated debt and asset strategies in the current environment. The Rewards of In-House Internships. Universities are some of the most complex organizations in the business world. This makes them great learning environments for students interested in business studies. This session will focus on how Pepperdine University, Malibu, Calif., has leveraged relationships between the finance office and the undergraduate business division to provide internships in accounting and finance to current students. Participants will learn how to build an in-house talent pool for entry-level positions. Keeping It Simple! A Desktop Approach to Global Risk Assessment. As institutions continue to expand international programs and projects, business officers need to know what risks, if any, these programs present to the university. This highly interactive session will demonstrate a newly developed, innovative global risk–assessment approach that will allow CBOs to quickly assess which activities require the allocation of additional resources and determine which may present a larger risk to the university. Seeking Alpha on Campus: The Case for Energy Efficiency Investing. Discover how three institutions are making strategic investments in energy efficiency upgrades and reaping significant annual energy savings. Panelists will share firsthand accounts from their respective campuses about their work to invest millions of dollars into energy efficiency projects. Self-managed revolving funds recycle the savings into the next round of upgrades. Roll up your sleeves on Saturday morning, July 18, for the 8th annual NACUBO “Serving the Community” project. This event has become a welcomed opportunity for attendees and guests to work together and “give back” to the annual meeting host city. Participation in this activity is a great way to make new friends, while helping some of our most challenged educational colleagues. In 2014, approximately 100 business officers and friends revitalized an elementary school in one of the neediest neighborhoods in Seattle. This year we will be hosting a similar project at a middle school in Nashville. There is no charge to participate; spouses, and children 18 years and older, can also participate. Plan to arrive in Nashville by Friday evening, because transportation departs from the Opryland Hotel early Saturday morning. For more information, contact bdillon@nacubo.org or visit NACUBO’s community service page at www.nacubo.org. NACUBO offers different ways for you to kick off your 2015 annual meeting experience. Whether you want to spend your day on the green with spectacular views or get fit with NACUBO, there is something for everyone. Here’s a look at what you can expect in Nashville. Golf tournament. Join colleagues Saturday morning on the President’s Reserve at Hermitage Golf Course for a challenging scramble and a one-of-a-kind Tennessee golf experience. The President’s Reserve, designed by architect Denis Griffiths (designer of Atlanta’s Chateau Elan Resort Course) trails through 300 acres of natural Tennessee wetlands and along the banks of the beautiful Cumberland River. NACUBO “Hits the Hall”—opening event. Saturday evening, registrants will take a walk through time, while enjoying food, drinks, and music during the opening event at the Country Music Hall of Fame and Museum. This isn’t just a museum—it’s an experience. Rhinestone costumes, seasoned instruments, and tearstained lyric sheets are only the beginning, as the museum is home to the largest collection of country music artifacts in the world. The Hall of Fame Rotunda honors the artists, songwriters, musicians, and others who shaped the history of country music. The museum is located in downtown Nashville. Shuttle bus transportation will be provided from the Gaylord Opryland. Expo. Feel the energy inside the exhibit hall where you can select your next service provider, develop relationships with corporate partners, discover solutions to today’s challenges, and connect with your current vendors during lunch. Visit more than 200 exhibiting companies and mingle with fellow attendees while enjoying local entertainment in the courtyards throughout the floor. There will be daily prize drawings. NACUBO Fitness. Evidence has shown that exercise has profound benefits on brain function in the areas of learning and memory. NACUBO wants to help you stay on top of your game by offering fitness options each day of the annual meeting. Join your colleagues for yoga and Zumba-like classes on Sunday and Monday. 5K Fun Run. Early Tuesday morning, the truly dedicated of NACUBO are invited to participate in the 5K Fun Run, which will be held at Two Rivers Greenway. Experience the beauty of Nashville’s interconnected green space of natural landscape features like streams, rivers, and ridges, or along built features such as railroad corridors and scenic highways. NACUBO “Down in the Delta”—closing event. We invite you to experience what makes Nashville special during this island party finale to the meeting. 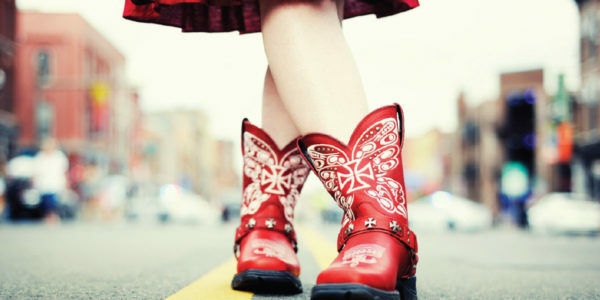 Nashville is a city that resonates with life and vibrates to the beat of every kind of song. It’s a town that sizzles with American music, Southern hospitality, unbelievable cuisine, and a boundless spectrum of entertainment. Come join us on the Delta Island of the Gaylord Opryland, and together we will keep the music playing. To enhance your NACUBO annual meeting experience, we encourage you to “take off” on Monday afternoon. You’ll have the option of participating in alternative programming sessions, campus tours, or one of a selection of special “Discover Nashville” tours. The 75-minute sessions and forums offered on Monday afternoon will provide attendees with in-depth, interactive learning opportunities on a variety of topics such as leadership, succession planning, and career development. These sessions, unlike the tours, will be eligible for CPE credit. A complete schedule and estimated CPEs will be available on the annual meeting website at www.nacuboannualmeeting.org. Campus Tours. On Monday afternoon, annual meeting attendees are invited to take a walking/bus tour of featured campuses in the host city. The Hermitage Mansion. The Hermitage Mansion has been meticulously restored to its 1837 appearance and today looks much as it did when Andrew Jackson returned to it after finishing his second term as president. After the home was damaged by fire in 1834, Jackson had it remodeled in the Greek revival style. The majority of the furniture in the home was purchased by the Jackson family to replace pieces damaged in the fire. Personal objects, like Jackson’s swords and books, also adorn the home along with the Jackson family’s portrait collection. The tour includes the Hermitage garden, Jackson’s tomb, and the “Beyond the Mansion” tour of sites related to slavery, farming, and nature at the Hermitage. “Nashville”—Behind the Scenes. Take a closer look at the city behind the television series “Nashville.” Since its premiere in the fall of 2012, “Nashville” has kept fans entertained on Wednesday nights on ABC. The show chronicles the lives of various fictitious country music singers in Nashville, and has created quite the buzz in living rooms across the world, receiving numerous nominations at the Golden Globes, the Primetime Emmys, and the People’s Choice Awards. See for yourself the sights, locations, and homes of some of your favorite characters, where the show has been filmed. Experience the famous Bluebird Cafe, the Ryman Auditorium, the Parthenon, and a variety of other spots loved by locals, and visited by many. For the art lover. Experience the Nashville art scene by spending some time at the Frist Center for the Visual Arts, a nonprofit art exhibition center. Approximately 24,000 square feet of gallery space is dedicated to presenting the finest visual art from local, state, and regional artists, as well as major U.S. and international exhibitions. The excursion will also include 5th Avenue of the Arts, a group of visual art galleries in downtown Nashville. The mission of the arts group is to offer ongoing visual arts experiences for locals as well as visitors, through a variety of exhibitions that change every month, along with special programs and events. 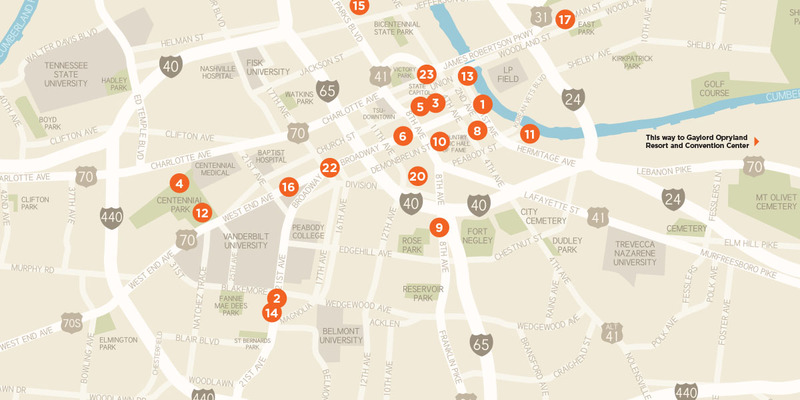 The 5th Avenue corridor features more than 15 art venues including the Arts Company, the Rymer Gallery, and Tinney Contemporary, as well as the eclectic Art at the Arcade, featuring Twist Gallery and Coop Gallery. Franklin and the Civil War. Experience Franklin, Tennessee’s part in history, by visiting three venues: the Carnton Plantation, built in 1826 (field hospital and burial place from the Battle of Franklin); the Carter House, a registered historic landmark and memorial refugee home—built in 1830; and the Lotz House (Civil War house museum). This tour explores the real people, places, and events in the novel “The Widow of the South” written by longtime Franklin resident Robert Hicks. Distillery District Tour and Tasting. Marathon Motor Works, a historic building that served as the production plant for the Marathon Motor Car from 1894 to 1908, now houses two of Nashville’s many distilleries. By 1885, there were hundreds of whiskey distilleries in Tennessee, but only a handful was producing significant volume. The three most notable were Cascade (now George Dickel), Jack Daniel’s, and, Charles Nelson’s Green Brier Distillery (now Belle Meade Bourbon). Corsair Distillery is a hidden gem of Nashville. The company’s spirits have been praised in publications like Food and Wine, Saveur, Whisky Advocate, Time Out New York, and Maxim.com. Corsair’s innovative and adventurous spirits have won 41 medals at international spirits competitions. Five corporate showcases offer new solutions to a variety of issues. Focused on a number of topics, these sessions will be integrated with the rest of the conference so that attendees can catch several throughout the annual meeting. Advance sign-up is not necessary. SSC—Creating Positive Change: Building a Sustainable Business Model With an Integrated Facility Management Program. Workday—Deploying Financials in the Cloud: Two Institutional Viewpoints. Oracle—Achieving Institutional Effectiveness Through Data-Driven Decisions. TIAA-CREF—The Next Generation of Retirement Plan Success Metrics. Mason Investment Advisory Services Inc.—Manager Selection: Efficient Market Based/Active Investment Study. For more information and to register for the NACUBO 2015 Annual Meeting, visit www.nacuboannualmeeting.org. Khesia Taylor, is associate editor, Business Officer. When you’re visiting a city for the first time, or with limited time to spare, it’s often hard to pick the activities, entertainment, or restaurants you absolutely must visit while in town. 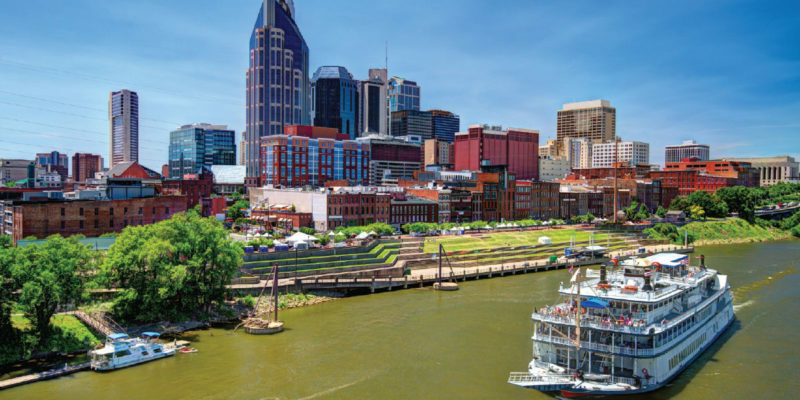 To ensure you make the most of your time, we’ve asked NACUBO members, who live in the area, to provide their “best of Nashville” choices for annual meeting visitors looking for fun or historical outings. Two preconference programs will provide attendees the opportunity to hone their leadership skills in Nashville. The New Business Officers Program (NBO), offered July 17–18 exclusively to those new to the chief business officer role within a higher education setting, is a workshop designed to provide essential resources, information, and guidance. Participants will examine the current complexities of their role and learn from experienced chief business officers, presidents, provosts, NACUBO experts, and other pivotal higher education representatives. Key issues for the success of every new business officer will be covered, from developing board relationships to communicating effectively with all types of institutional constituents. An optional session for new CBOs who are also new to the field of higher education administration is offered on Thursday afternoon, July 16. The Future Business Officers Program (FBO), to be held July 18, is designed for business office staff who are ready to gain the leadership skills and organizational perspectives necessary to become chief business officers. The workshop will focus on topics such as understanding the complex role and responsibilities of the CBO, building relationships in the higher education environment, and communicating more effectively. Attendees at either program will earn CPE credits and do not need to register for the annual meeting to attend the workshops. To find out about the program schedule and for more information, visit www.nacuboannualmeeting.org/education. As the first 2015 annual meeting registrant, Paté received a gift basket from NACUBO, which included a Martina McBride CD, water bottle, baseball cap, bottle opener, and Music City chocolate, courtesy of the Nashville convention and visitors bureau. Additional CPEs can be earned by attending either the New Business Officers Program or the Future Business Officers Program preconference.